this keyword in Java is a reference variable that refers to the current class object. In other words, it holds the reference to the current class object or same class object. The current class object can be referred by using this reference to anywhere in the class. The keyword this can be applied to instance variables, constructors, and methods. It is used only inside the class i.e only inside the member functions of the class and can only be used within the non-static function of the class. This reference cannot be used outside the class. this.a; // variable case where a is an instance variable. this(int a); // To call parameterize constructor of current class object. Note: this and super keyword cannot be used in a static method and static initialization block. This will give compile time error. 1. this reference can be used to refer to the current class instance variable. 2. this keyword is used to call the non-static method of the current class. 3. this() can be used to invoke the current class constructor. 4. this keyword can be used as a parameter in the method call. 5. The keyword this can be used as a parameter in the constructor call. 6. It can also be used to return the object of the current class from the method. Java this keyword can be used to refer current class instance variable. If there is ambiguity between the instance variables and parameters, this reference can resolve the problem of ambiguity. Let's take a simple example program to understand the problem of ambiguity that will occur in the given below program. In the above example program, the parameter's identifier(formal arguments) is the same as that of the instance variable. It is permissible to do this in java. But, there occurs the problem of ambiguity between the parameters and instance variables. So, we can resolve this problem by using this keyword in java programming. Solution to solve the above problem using this keyword. In the main, the object reference variable 's' is the current object in context. So, this reference stores the reference of object reference variable s. In the parameterized constructor of class Student, this.name and this.rollno refers to the data field of the current class object s. Here, the current class object means the same class object. They can also be written without using this keyword. But as the parameters (local variables) of instance method are having the same name as the instance variables of the class, we have to use the keyword this. Note: If the local variables(formal arguments) and instance variables are different, there is no need to use the keyword 'this'. For more detail, read out Constructor in Java. The keyword 'this' can be used to call the method of the current class. If you do not write 'this' keyword, the compiler automatically adds 'this' keyword while invoking the method. 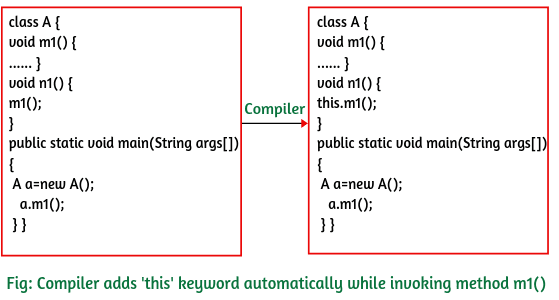 The following example shows how to add 'this' keyword automatically by the compiler while calling the method. Let's understand a simple practical example program related to it. The method incr() returns a reference to the current object. Inside the main method, when add.incr is called using reference variable add, num is incremented to 21 and the reference of the current object is returned which again calls incr() method. This is done two times. So, number becomes 22. In the end, the show method is called using the reference variable which displays the number: 22. The this() keyword in Java can also be used to call another current class constructor from within a constructor. This is called an explicit invocation constructor. It is used for constructor chaining. 1. The invocation of another constructor using 'this' keyword must be the first line of constructor only. That means we cannot add this() keyword anywhere other than the first line of the constructor. 2. JVM never put automatically this keyword like super. 3. Recursion using 'this' call to the constructor is not allowed in Java. Let's see some example programs. In the main method of class ABCTest, when an object is created for class ABC with passing an argument 12, it calls the parameterized constructor of class ABC. The keyword this in the first line of the constructor will call the default constructor of class ABC and prints the output "HELLO DEEPAK" on the console. After printing the first output, the control of execution again comes to the parameterized constructor and prints the output "WELCOME INDIA". The keyword 'this' in Java can be used to pass as an argument in the method. It is mainly used in the event handling. Let's see a simple example program to understand the concept. You can also pass this keyword in the constructor call. This concept is useful when you have to use one object in multiple classes. Let's take one simple example program. The keyword 'this' can be returned as a statement from the method. In such a case, the return type of the method must be the class type (non-primitive). In this example program, we will prove that the keyword 'this' refers to the current class object or not. As you can see in the output of the above program, the address of this and object reference variable are the same. This shows that this keyword in Java refers to the current class object. 1. "this" is a reference variable which contains current class objects. "super" is a reference variable which contains immediate super class objects. 2. Any member of the current class object from within an instance method or a constructor can be referred by using this keyword. If the method overrides one of its super class's method, the overridden method can be called through the use of super keyword. 3. 'this' keyword is used to call another constructor from within a constructor in the same class. 'super' keyword is used to call the super class's constructor from within a constructor of the subclass. 4. JVM never put automatically this() keyword like super() in Java. By default JVM automatically put the super() keyword at first line inside the constructor. Hope that this article has covered almost all important topics related to this keyword in Java. Uses and their practical example programs are very important for freshers. We hope that you have enjoyed the article.